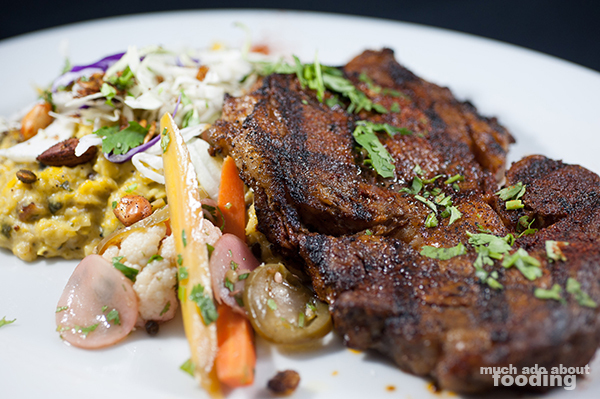 Nearly a year ago, the folks over at the beloved Kentro Greek Kitchen in Fullerton decided to pull together and open an American-Latin restaurant to give exposure to Latin and American classics will showcasing local ingredients. El Amerikano is helmed by Chef Konstantine Marougas, who also dishes up the food at Kentro, and features the food in a modern setting. We were invited one evening to a media event to see what new dishes were being added to the menu which boasts itself as "New American cuisine with a Latin flair" and protein-centric. The first two bites to hit were of the Cucumber Ceviche and their Warm Mushroom Salad. The two were quite different from each other as the ceviche focused more on the crisp and crunch of raw, fresh vegetables, and the mushroom salad brought a savory aspect to the term "salad" which might turn people into the mindset of "this must be healthy and boring." 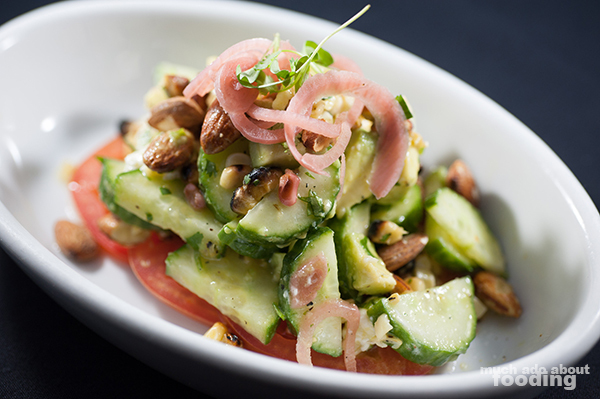 We enjoyed how light and refreshing the cucumber ceviche was; the inclusion of pickled onion gave it an acidity that pulled forth the likening to being a ceviche. I particularly enjoyed how the warm mushroom salad's ingredients were wilted from the warmth but still maintained their vegetal crisp, especially in the bean sprouts. 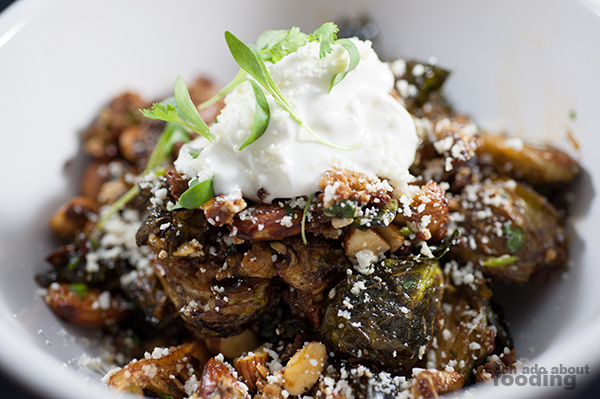 The next two out were their Brussels Sprouts with House-Made Chorizo and Imported Cotija and a surprising Eggplant Mole. 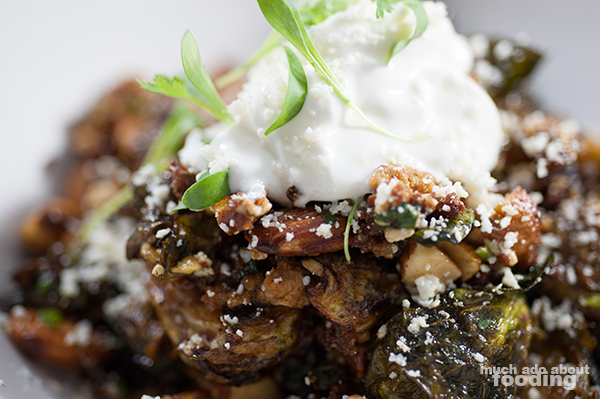 If you are a fan of brussels sprouts, you might want to dig into El Amerikano's version of it because these were roasted to perfection. The chorizo made some portions a bit saltier than we liked but what an apt, and more unique, substitute to the typical bacon that most places are mixing with their brussels sprouts these days. Cotija on top helped mellow out what could have been overbearingly heavy but still matched in level of umami. Again, a bit salty but that's all the more reason to just share with others. What seems to delight plenty that evening including ourselves was the eggplant mole, a savory and rich dish that is not all too common from other restaurants we've seen. 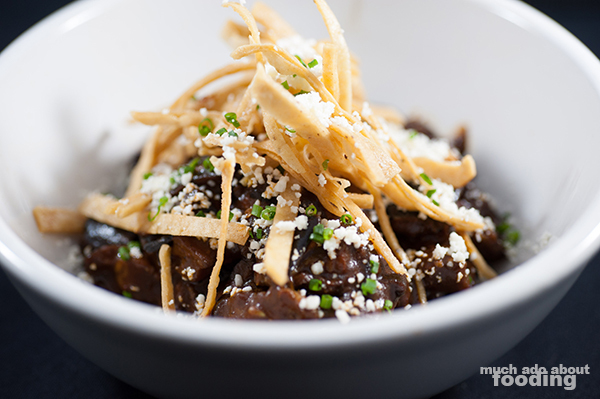 It also added to the vegetarian-friendly aspect of new menus items we saw with the ceviche and mushroom salad being other parts; if you can have delicious mole and share it with even your vegetarian friends, why not? This was quite flavorful and comforting, a favorite for sure. We ended the evening with bites of Chef's Al Pastor Chop (char-grilled pork chop with Chef's made-from-scratch “al pastor glaze” paired with spicy farro salad, housemade jalapeno vinaigrette, poblano chiles, and sweet peppers) and the Asada Brava (angus choice rib eye seasoned with housemade Latin rub paired with creamed corn with nuts tossed with cumin, Mexican oregano, and cayenne, and finished with cheese folded in). 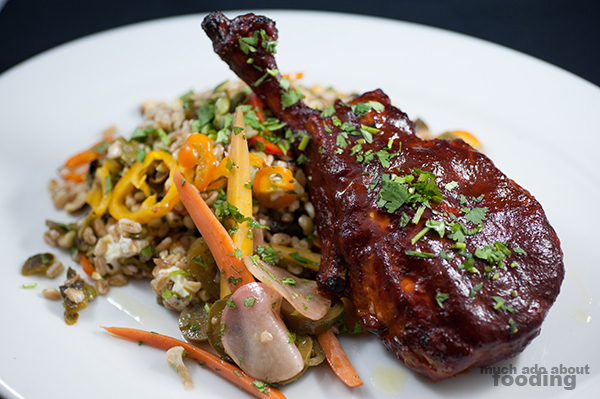 The chop would easily appeal to those who like their proteins sweet and smoky as the glaze gives it that profile; paired with the spiciness of the farro (a great grain to have! ), it gets balanced out well. If rib eye is more your style, this version has plenty of Latin flair to it from all of the spices in the rub. 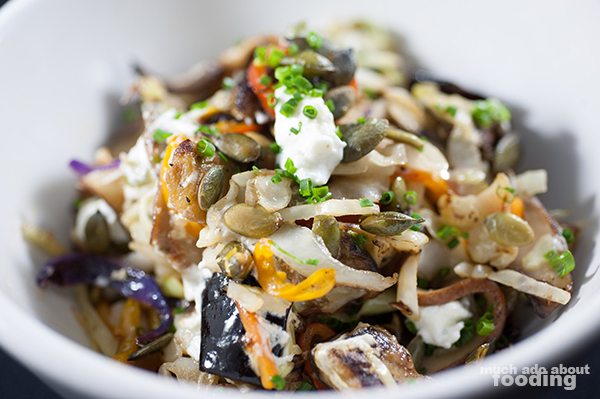 Curious about giving the new menu items a try for yourself? Find El Amerikano at 100 South Harbor Blvd., Suite D in Fullerton with plenty of parking behind the restaurant itself. It's open daily until 10pm and might just be a go-to spot if you want a more modern twist to Latin food.